The R3, at twenty-three feet, ten inches length overall with swim platform is one of two brand new models in Cobalt’s bowrider “BR Series” for 2014, the other being its big brother R7 at twenty-seven feet, six inches. These two new models join the popular R5, part of the ten model BR Series of bowriders from 22½ to almost 33 feet. For 2014, Cobalt Boats of Neodesha, Kansas, in business for almost fifty years, offers a total of twenty-nine models in six series of bowriders, sport decks, cuddies, cruisers, and water sports boats from twenty to almost thirty-three feet. The new R3 represents Cobalt at perhaps its finest with its classy, elegant, and luxurious appointments. The base boat with its complement of standard equipment ensures you of all the amenities that make it a Cobalt, but most will choose many items from the very extensive list of optionally available accessories to personalize the boat to their own desires with luxurious features often not even available from other builders. Structurally, the R3 follows Cobalt’s all-composite construction with a 21° deadrise deep-V hull with extended running surface, Kevlar® reinforcement on the keel, and a proprietary barrier coat applied to the outer hull. Hull graphics are in the gelcoat and not vinyl applied on the outside. All seat construction is also wood free “Vara Dense” with StarBoard/Kelron seat bases. The integrated swim platform situated just above the waterline on the R3 features Cobalt’s unique flip-down swim step; a deep, double-wide recessed centre section of the platform which flips over and down well below the waterline to allow sitting plus easy access into the water or back into the boat. Cobalt adds a perimeter polished tubular stainless steel rail to protect the platform from “dock rash” and to provide a handy grab rail for swimmers. A starboard side walkway leads from the swim platform into the cockpit while passing one of the unique features of the R3 – a rear-facing aft sunpad which Cobalt refers to as a rumble seat. A large cushion portion of this sunpad becomes an adjustable backrest to allow rearward transom seating or when folded down, becomes part of the sunpad when the seatback portion of the rear cockpit lounge seat is flipped forward to convert to a sunlounge. Fully padded backrests surround the flexible bow seating allowing forward-facing lounging with finished storage below the seats. An anchor locker is located in the foredeck. In the cockpit, the two-person passenger seat backrest flips forward to create a portside lounge which extends L-shaped across the transom. Opposite on the starboard side, a single seat facing athwartship is situated behind the driver’s bucket seat with flip-up forward bolster. The aluminum dash panel with custom stitched composite helm eyebrow and perimeter wood accent features a digital compass, hour meter, a depth, water & air temperature gauge package, stainless steel switches, and a black leather rimmed stainless steel steering wheel. Standard entertainment includes an AM/FM Bluetooth stereo with iPod, USB, MP3 port, and six speakers with a dash-mounted remote. Accessories available to personalize the outside of your R3 include a stainless steel/aluminum arch with sunshade, stainless steel docking lights, transom lighting above the swim platform or underwater lighting below it, Cobalt’s Sof-Trac mat for the swim platform, a handy set of four flush-mounted fender mounting hardware with inserts, lines and fenders, transom shower, and electric engine hatch. Optional canvas includes a bimini top with Cobalt’s adjustable stainless steel turn-buckle supports, bow, cockpit, and mooring covers. Inside your R3, choose from a host of upgrades including a sunpad filler cushion on the transom portside with or without the optional dinette table with a second cockpit receptacle, two choices of cockpit carpeting, transom gate, bow filler cushion, and an air compressor with holder. Helm options include a real fancy Del Mar captain’s chair, Garmin GPS choices, and an oil rubbed wood dash trim package. Step up to an optional Premium Sound System with transom remote. Mechanically, choose from Volvo Penta Duo-Prop with optional Electronic Vessel Control (EVC) or MerCruiser Bravo 3 with optional Digital Throttle and Shift (DTS) sterndrive packages from 300 to 430 horsepower. 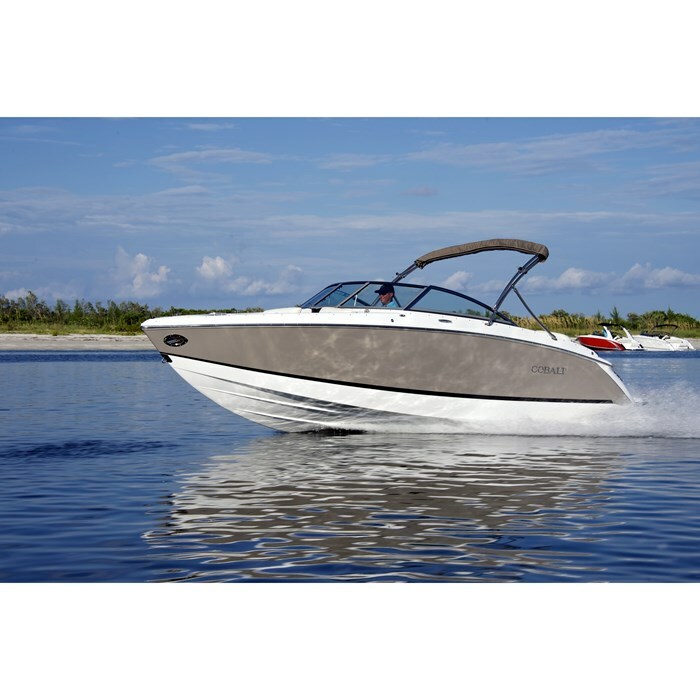 Also available are dual batteries, a battery charger, automatic fire extinguishing system, trim tabs with dash indicators, Perfect Pass cruise control, and a driver’s windshield-mounted rear-view mirror. However you equip your R3, you will always know and appreciate that it is a Cobalt.